The tender for a residential site at Hillview Avenue closed Tuesday with a top bid of $243.2 million, said the Urban Redevelopment Authority (URA). Of the seven bidders, Kingsford Development handed in the highest bid for the 99-year lease site, which was launched for tender on January 19. The second highest bid of $205.1 million came from Flamegold (a unit of UOL Group), followed by MCL Land which made a bid of $190.5 million. The lowest bid was $147.98 million by Capital Development. 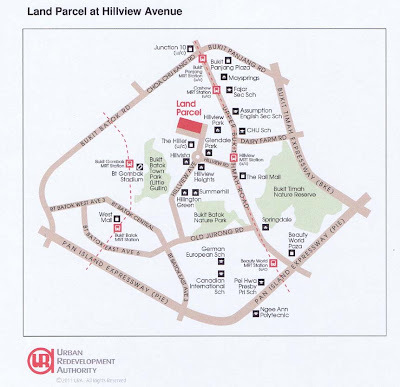 The site at Hillview Avenue measures 12,648.5sqm with maximum permissible gross floor area of 35,416sqm. URA said it will evaluate the bids and the tender award will be announced at a later date. Nicholas Mak, executive director, Research & Consultancy Department at SLP International Property Consultants said the site received "bullish" bids with the top bid 18.6% higher than the second highest bid. "This is the highest difference between the top and second highest bid since February 2011, when the GLS tender for the condominium site at Bishan Street 14 concluded," he added. Mr Mak also noted that the 99-year development - The Hillier - an uncompleted project launched in January 2012 achieved an average price of $1,296psf to date. "The top bid for this Hillview site could result in a breakeven price of $1,010 to $1,060psf. To yield a decent profit, the developer would have to sell the units in the development at prices above $1,200 psf," he said. Li Hiaw Ho, executive director, CBRE Research noted that URA reported that the soho-styled apartments at The Hillier sold about 450 units to date. "The success of The Hiller could be the reason for the optimistic top bid for the site," he added. No Comment to " $243 million top bid for Hillview Avenue site "
Bishan more expensive than Grange Road..?! So how did the resale market do in Feb 2012? February private homes sales up 29%! Enbloc News: Seletar Garden sold! EC: Easier now for second-time buyer!